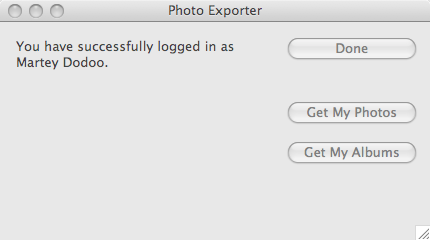 Photo Exporter is an application for exporting your photographs from Facebook. You can export either all photos where you have been tagged or all albums that you have uploaded. I wrote this application because one of my friends lost a year's worth of data after her computer's hard drive gave up the ghost. Luckily, she had uploaded most or all of the pictures she had taken during the year to Facebook. Unfortunately, there was no automated way to download everything. Unlike most of the other data contained in Facebook, one can use the Facebook API to extract the URL of photographs and then download them. The only other application I could find with similar features was web-based. Since the purpose of such an application is to download photos from Facebook to your computer, it does not make sense to use someone else's server. xkcd is right about Python - it is a joy to program in. Because of Python, I was able to write the initial code in Linux and then quickly port it to OS X and Windows (with py2app and py2exe, respectively). The Facebook sections are from pyfacebook. Anyway, without further ado, the download links. There is no Linux version as of yet, since I reformatted my Thinkpad with Windows XP in order to develop the Windows version. Besides the obvious speed and resources issues that could arise from using an external server, an unscrupulous programmer could create a photo exporting application that also saved a copy of all photos that a user of the application accessed. pyfacebook is licensed under a BSD license, which does not require the disclosure of source code (did I mention Photo Exporter was closed source? no? ), but does require copyright information to be placed in the documentation of any redistributed applications, like Photo Exporter. No COPYING file exists in the code repository, as least as far as I could tell. I am not exactly sure what is supposed to occur when someone releases code with unclear copyright status under a permissive license, but if a pyfacebook developer reads this and wants to create a COPYING file or send me the copyright information for the code, I would appreciate it.